George Lucas faced a unique challenge with Episode II. For years, fans have recognized the Stormtroopers' spooky white space armor as a symbol of the enemy, of something to be feared and hated. Anyone in that white plastic gear would immediately be distrusted, and that applied to their ancestors, the Republic's clone troopers, as well. Star Wars figures have always had minimal articulation - it was they that made the Big Five the determining factor for an "action" figure, and they haven't grown very far beyond those days. Finally, however, Hasbro has taken a step forward with its first super poseable figure. Now, "superposeable" is a relative term: a superposeable ToyBiz figure will have at least 30 points of articulation; a superposeable McFarlane toy will have six. In the realm of 3¾" figures, "superposeable" apparently means 14. The Clone Trooper moves at the neck, shoulders, elbows, wrists, chest, hips, knees and ankles, and most of those are balljoints. The hips are just peg joints, which kind of limits the range of motion, especially when compared to all the other joints. He comes with his blaster pistol, which is nice enough, but a variety of weapons may have been better - a heavy blaster, a rifle, maybe some binoculars... you know, stuff to add some variety. The figure's design is right on - he's got the proto-Stormtrooper gear we saw in the film, from the goofy helmet on down. I have to say, while the Clone Troopers are suposed to be the ultimate force on the side of right, whomever the Republic servant was who designed their armor sure did a bad job above the shoulders. I'm glad these guys evolved into something better by the time the original trilogy will have had come around. Star Wars' Stormtroopers were always perfect examples of troop builders: the character who was generic enough to build an army. The downside was that even the most substantial homemade army was still comprised of only four or five different poses. 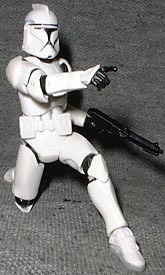 By releasing a superposeable Clone Trooper, Hasbro has given fans the opportunity to do create more realistic, varied armies to command. You'd think this would be standard practice, because it encourages repeat purchases of a single figure - Hasbro could put a superposeable trooper (either Clone or Storm) in every case from now until the license expires and people would still be buying them eagerly. So how did Lucas make sure audiences would accept the Clones? At every opportunity, he digitally inserted Clone Troopers behind the Jedi, flanking them and awaiting instruction. They became less threatening and more supporting, forces for good instead of evil. Rewriting decades' worth of ingrained response in just two hours is no small feat, but Lucas managed. It's also a perfect example of the subtle use of digital effects for a better product.